Browse our selection of Promo Items such as Royale 30" x 60" Beach Towel for your upcoming tradeshow, seminar or promotional event. Give your valuable customers the royal treatment with a custom-printed gift in the form of our Royale 30” x 60” Beach Towel. It will be busy promoting your brand when your recipients lay on the beach or pop out of the pool. 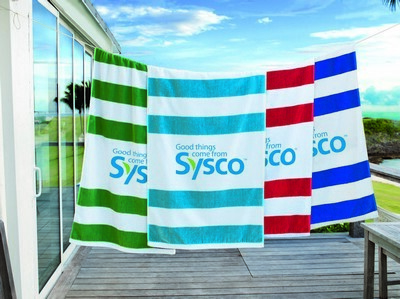 Made out of highly absorbent cotton, this towel makes a great wrap after dipping in the pool. 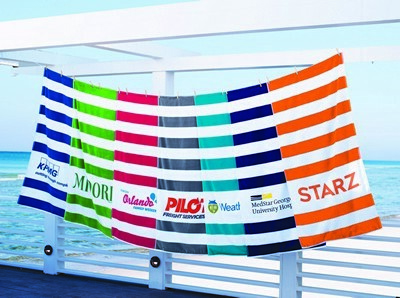 Attractive cabana stripes give this beach towel a classic look. Choose from various attractive color options and add your business details to create impressive corporate giveaway for your upcoming event. Minimum number of items in each order: 36 items.